Okay, monster is a bit too strong a term for this beauty, until you have been bitten by one, that is. Luckily, most horseflies are merely bothersome to me relative to the many other types of flying biting things that attack us here in the southeast – mosquitoes and deer flies being much more aggravating in my opinion. The reason being that most horseflies are both noisy fliers and are relatively slow to react, so you can hear them coming and swat them. They also tend to come at you in smaller numbers than the squadrons of deer flies and swarms of mosquitoes that occasionally partake of my blood. This is all true unless you happen to have both hands occupied when they attack. Such was the case last week when I was working to replace the worn out screening on the porch. Two hands and my mind occupied with holding and stapling equals horsefly advantage. That moment when the painful bite hits you is when they become a monster. Male horseflies are nectar feeders and are incapable of biting, as they lack the modifications of the mouth-parts found in females. But a female horsefly has a Swiss Army knife of adaptations for slicing into your flesh. One writer said the mouth-parts of the female are modified into the equivalent of miniature scalpels or steak knives ideal for cutting the skin. That pretty much sums up the strategy – rip open the flesh and then lap up the blood of the victim. 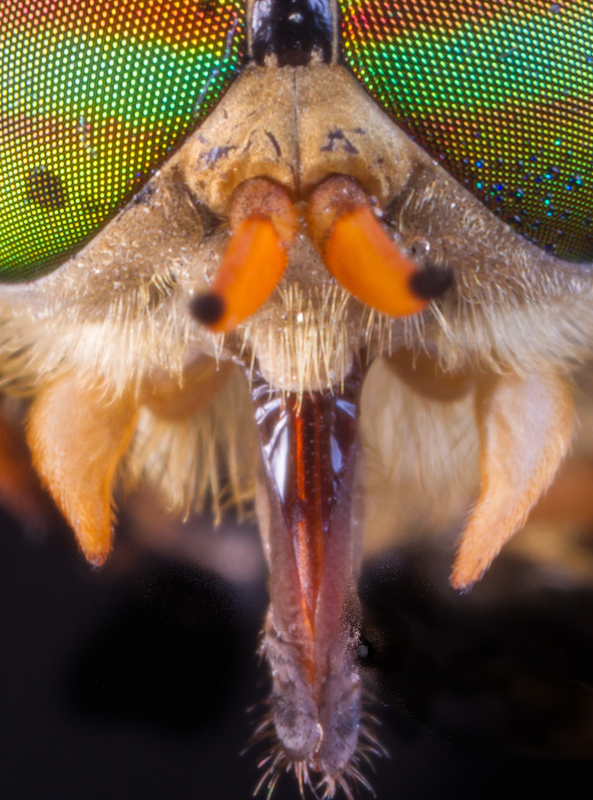 This is why a horsefly bite is so much more painful than that of a mosquito – the mouth-parts are for tearing and lapping, not piercing. As in many other blood-sucking insects, the female’s saliva contains anticoagulants which help the victim’s blood flow so she can secure enough nourishment for egg laying. 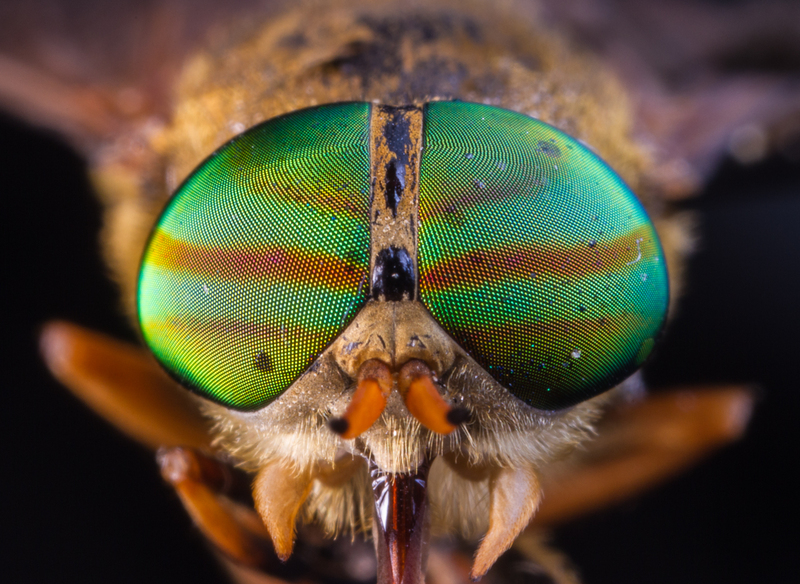 In spite of the impressive “jaws” of horseflies, what I notice about this particular species (I think this is probably Tabanus fuvulus) are its eyes – incredibly complex and beautiful green eyes. 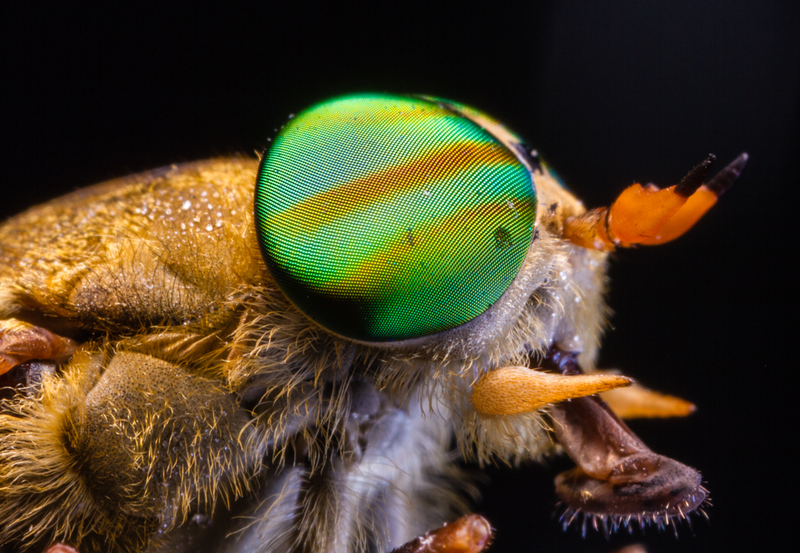 While trying to find some information on the unusual stripes in their eyes, I came across some interesting research on the vision of horseflies. In a paper published in March 2012 in the Journal of Experimental Biology, researchers investigating the evolution of the striped patterns of Zebras made a fascinating discovery. Horseflies use polarized light hitting water as a guide to places to mate and lay eggs. They also use such light hitting dark mammal hides as a way to find a blood meal. By setting up models of varying colors and stripe patterns, the researchers demonstrated that a zebra-striped horse model attracts far fewer horseflies than either black, brown, grey or white equivalents. Because the coat reflects light in alternately polarized and non-polarized patterns, the Zebra “is more difficult to single out relative to the surroundings.” It is, in effect, camouflaged to flies as well as to lions. I know what I am wearing the next time I screen a porch. 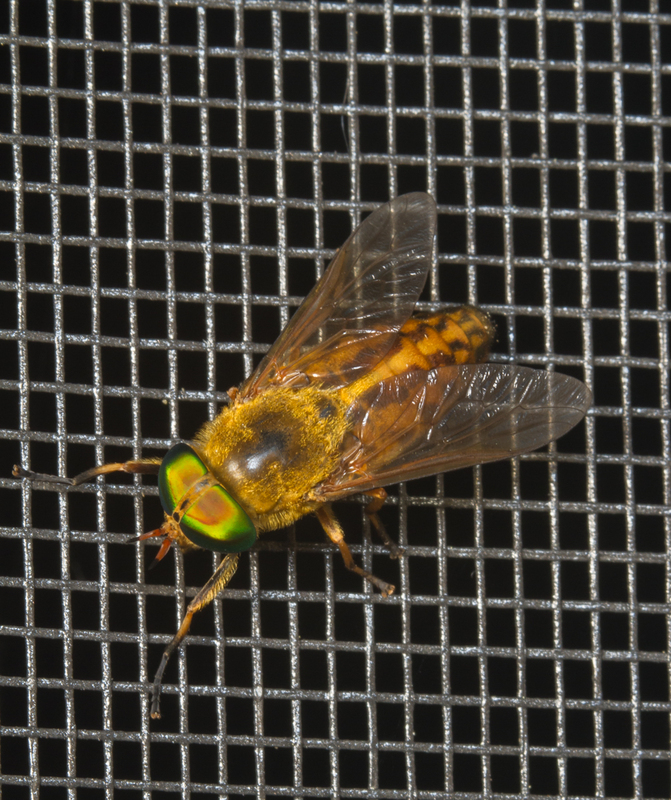 This entry was posted in Natural History and tagged biting flies, horsefly by roadsendnaturalist. Bookmark the permalink.